Lamborghini Gallardo Superleggera, originally uploaded by Epiphany Cupcakes. What do you give your boss, the man who has everything (including a beautiful Lamborghini Gallardo) for his birthday? A cake replica of his car of course! The cake inside is madeira. 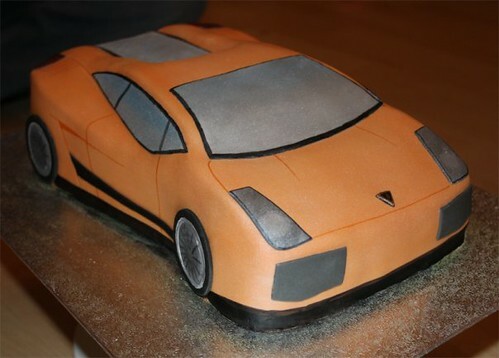 Carved to shape, covered with vanilla buttercream then draped in orange fondant and brushed all over with yellow lustre dust to replicate the pearlescence of the real car. Then detailed in fondant and colouring paste. Finished cake was approx 14" long and was a resounding success!